Ofcom has emailed HEXUS with details of a new Code of Practice which will come into effect from tomorrow, 1st March 2019. New protections will be put into force which are designed to ensure 'Fairness for Customers' in the UK broadband market. Under the new rules it is hoped that new customers will be easily be able to get the best deals available, and they will be treated fairly throughout their contract period - and if not they will be able to leave, penalty free. Above is a storyboard outlining the way broadband sales and service will work in the UK from tomorrow. All major providers have signed up to the new code, including BT, EE, Plusnet, Sky, TalkTalk and Virgin Media - which combine to address 95 per cent of the home broadband market. Firms must give minimum and peak-time speeds, before customers sign up to a deal. If there are any issues with the service, regarding reliability and or speeds then there will be provisions to walk away from any contract penalty free. These rights apply regardless of broadband technology (whether you use LTE, Fibre, ADSL etc) and will include the right to cancel other services bundled at sale (TV, phone etc). At the time of writing I couldn't find any resource that provided precise information about the threshold of problems a customer must face before being allowed to break their contract, penalty-free. 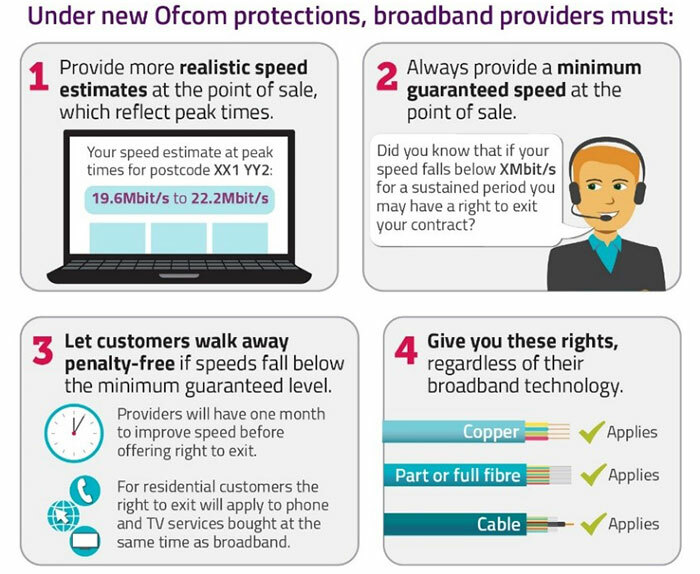 All I see is the same information Ofcom emailed me, and available on its blog, which states that "if a customer's broadband speed drops below the promised level, companies will have one month to improve performance, before they must let the customer walk away - penalty-free." A month is a pretty long time to put up with a bad broadband connection - just imagine if water, gas, or electricity suppliers could be so lax. Perhaps more details about service acceptability thresholds will be published tomorrow. Other fairness for Customers initiatives announced today include; a new Boost Your Broadband campaign to encourage switching to faster and cheaper deals, plans to introduce a yearly broadband deals reminder system, reviewing ISP and mobile operator pricing practices, and introducing a simple text-based broadband switching process. Sounds fair to me, saw an advert on TV the otherday where a provider said they has some sort of speed guarantee, but that was only valid for the first 30 days of your contract, seems a bit rude..
any mention of not ramping the prices during your contract? THAT is the more annoying thing for me tbh. I would also like to see a right to cancel if there are frequent or lengthy service interruptions. I would suggest that if your internet is down for more that 3 days, or if there are more than 5 outages per month (each lasting more than 30 seconds), then you get released from your contract and can cancel without an early termination fee. how would you prove it? It's your word against theirs, and they would hold the power.